This 100ft Siamese Cable is made of 95% shielded RG59 siamese cabling that carries both BNC video and 12V power together. Instead of using regular RG59 coax wire or RG58 coax cabling, use this cable to send power and video from the camera through one cabling. You can either use this as the only wire on the camera, or you can use it as a 100ft extension for your existing coax cabling. 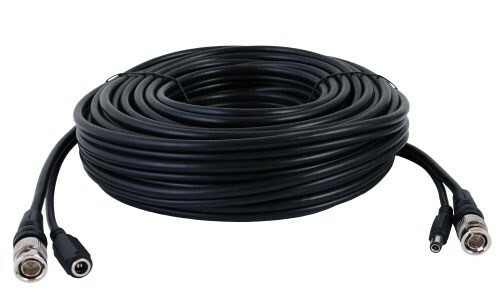 For those new to CCTV you will find it helpful to know that you can use up to 300ft of video wire. For longer distances beyond 300ft you will need a video amplifier. Also make sure that your power supply is of enough amps to power the camera at the distance you are planning to use it. For example if you are using a camera with infrared LEDs for night vision and you are running a 100ft wire to it, chances are you will need a 12V 2amp power supply, otherwise either your camera will not turn on or the infrared will not turn on. If you have any questions about cabling just email us, we will be glad to help.